What roles have the emerging BRICS powers played throughout the crisis of the Islamic State? Reflecting on this can tell us about the internal and external nature of both the emerging powers and the more multipolar world that has been constantly heralded. 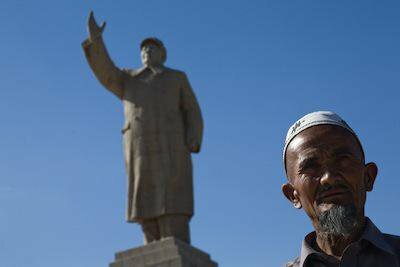 Beijing's uneasy relationship with Xinjiang's Uighur Muslim population. Demotix/Peter Carney. All rights reserved.In June the Sunni jihadist Islamic State (IS) advanced across western Iraq, aided by the virtual collapse of the Shia-dominated Iraqi army and around 300,000 people fleeing the city of Mosul. In early August the focus shifted to the north when IS targeted Kurdish positions and non-Muslims were subjected to murder, maltreatment and religious and ethnic cleansing. This exacerbated an already strained humanitarian crisis, following the displacement of hundreds of thousands and the presence of an already enormous refugee crisis related to the civil war in neighbouring Syria. Despite US president Barack Obama’s efforts to stay out of the conflict, he soon ordered air strikes against IS targets and assistance to the Kurdish militia, the peshmerga, alongside humanitarian relief to refugees. Meanwhile Washington focused criticism on the divisively sectarian policies of the prime minister, Nouri al-Maliki, and demanded a more inclusive government which would accommodate Sunni disaffection. Al-Maliki’s party, which came first in the parliamentary elections, duly obliged and proposed an alternative, Haider al-Abadi, to head a new government. The US has been a visible external presence throughout the summer crisis. But what roles have other emerging powers played? And what impact have developments in Iraq had on them domestically? It might seem an extravagance to spend time asking such questions, especially when the US is so prominent. Yet it is precisely through these questions that we can explore the internal and external nature of both emerging powers and the more multipolar world that we are apparently moving into. Therefore, to consider this, I have looked at one of the most conspicuous groups of rising powers, namely the so-called BRICS: Brazil, Russia, India, China and South Africa. The BRICS constitute an odd grouping. They include both democracies (Brazil, India and South Africa) as well as more authoritarian regimes (Russia and China). Economically, there is considerable disparity: China is the second largest economy in the world while South Africa barely makes the top 30. And yet the BRICS offer a useful representation of rising powers: as a group they make up around 30 percent of the world population and around 20 percent of global GDP (up from 8 percent in 2000). Even though they do not coordinate policies and actions (like the European Union), they have institutionalised their cooperation, through regular annual summits and the recent creation of a development bank in June. Despite the growing coordination and activism of the BRICS on the international stage, it comes with limits. The most prominent of these is a strong aversion to foreign intervention and a commitment to state sovereignty. For example, during the Arab Spring and in debates at the UN Security Council, BRICS countries have been generally sceptical regarding intervention by outside powers. This included the concern that the establishment of a no-fly zone in Libya in 2011 might presage greater intervention by the West. Similarly, Russia and China have consistently rejected sanctions against the Syrian regime in its civil war; indeed, Moscow pressed for and has largely overseen and led the disbanding of Syria’s chemical weapons arsenal following Damascus’ alleged use against civilians in August 2013. In Iraq a similar wariness by the BRICS to intervene has been present. In contrast to the US, France and Britain, the BRICS have not shown any interest in directly challenging the IS or pressuring the Baghdad regime for change. Instead they have made general statements emphasising the need for a strong and stable government which represents the interests of the population. Beyond that there have been almost no efforts to directly influence the domestic politics of Iraq or the region. Yet even if the BRICS oppose direct intervention in Iraq, this does not mean they have sat passively on the side lines. Russia and China particularly have important business interests in the country: Russia through its arms sales to Baghdad and China through its investment, capital and 10,000 workers working in oil fields in the south and the Kurdish north. For Russia, the IS crisis has been a business opportunity. Following a 4.2 billion dollar deal of attack helicopters and jet fighters with Baghdad in 2012 (Iraq’s largest arms purchase which is neither American nor Western in origin), in June it completed a further sale of military hardware and helicopters worth another one billion dollars for artillery, including rocket launchers and mortars. As for China, some analysts have quipped that China’s growing economic involvement in the country suggests that although the US fought the Iraq war in 2003, it has been China which effectively ‘won’ through the contracts won by its state enterprises and their ten billion dollar investment spent in the country. China’s interest in Iraq owes much to its economic development and the pressure for oil imports to maintain it. China imports about half of the oil produced in Iraq. Yet this high proportion does not mean that China is vulnerable since Iraq constitutes only ten percent of its total oil imports and less than one percent of its total energy needs. Even if Beijing’s interests are not yet directly threatened by the IS advance and the political disorder in Baghdad, the foreign ministry was reported to have an “open attitude towards any actions that facilitate ensuring security and stability in Iraq on the precondition of putting respect in place for Iraq’s sovereignty” – in short, withholding judgment on American airstrikes for now. This is in marked contrast to its previous opposition to American intervention in the country and the region more generally. At the same time, China benefits from American action with little cost to itself, a point that has not gone unnoticed in Washington where Obama has grumbled about Beijing behaving like a ‘free rider’ and wanting to see it play a greater role. Of less importance than Russia and China is India. Although it is not a strong state player in Iraq, it has both energy, business and labour interests through oil imports, investments in the construction, manufacturing and service sector and (until June) 22,000 nationals working there. In contrast to China, its interests were directly affected during IS’ initial advance when it took around 40 Indian nurses hostage in Tikrit in June. Following negotiations they were eventually released. However, at least seven others have been held hostage since IS took control of Mosul, further demonstrating Indian vulnerability within the region. Of the two remaining BRICS, Brazil and South Africa, their economic footprint is virtually negligible in Iraq. Indeed, in the Brazilian case the bulk of its capital investment and assistance in manufacturing (chiefly in construction and Iraq’s auto industry) was downgraded and removed in the wake of the 1990 Gulf crisis. In addition, unlike China and India, there are few Brazilians and South Africans based in the country, meaning that both they and their governments are less susceptible to the risk of hostage taking. The recent focus on IS in Iraq has been on the efforts to establish a new state which transcends present day borders. However, following the murder of the American journalist James Foley, by an apparently British-born IS militant in Syria in August, attention has shifted towards the radicalisation of Muslims in the West. A similar development may also be seen in relation to the BRICS countries and an apparent conflation between domestic unrest and global jihad by both IS and national governments. Just as the Western media is reporting that young Muslim men in Europe are becoming attracted to IS’ exploits and are travelling to Syria and Iraq to join them, Indian and South African newspapers have reported the same. At the same time, IS leaders have exploited both actual and perceived state repression against their co-religionists – and specifically the Sunnis. In one of his first public pronouncements in June, IS leader Abu Bakr al-Baghdadi included India and China as states which were oppressing their Muslim populations. In China al-Baghdadi’s words provided a global sheen to an ongoing state of unrest between the Beijing government and its treatment of the Muslim ethnic minority Uighur population in the north-western and mineral-rich province of Xinjiang. Primarily domestic in origin, the conflict has escalated violently over the past year. The range of violence has included a suicide bomb in a car in Beijing’s Forbidden City in October 2013, a knife attack by a gang which killed 29 people at Kunming train station in March, explosives in a marketplace in Urumqi, Xinjiang’s capital, which killed 31 people in May, and coordinated attacks against government and police buildings at the end of July, resulting in dozens being killed. Beijing’s response has been harsh, including stepping up checks and detaining people based on Islamic dress and customs. As well as identifying with Muslims across borders, IS has also contributed to conflict within Islam. This is principally through its identification with the Sunnis and their opposition towards the Shia and other sects. This has created problems in India, which has the second largest Muslim population in the world, and where al-Baghdadi’s words have stirred up a previously dormant sectarian divide. Increasingly, Indian Muslims are distinguishing themselves as either Sunni or Shia. At one end are the few Sunnis who have travelled to join IS and their fight. At the other end are the Shia who are outraged by developments in India. Indeed, one Delhi-based Shia organisation has apparently signed up 25,000 volunteers who claim to be prepared to travel to Iraq and support their co-religionists, including protecting the Shia shrines in the cities of Najaf and Karbala. Overseeing this polarisation is the New Delhi government, which has spoken out against its nationals travelling to the country and has provided assistance to around 5000 nationals to return home. Although some of the BRICS have business interests in Iraq and face the risk of growing radicalisation in their own Muslim populations, it is unlikely that there will be significant change in the way they approach the current crisis. Certainly, the language and activity both of groups like IS and the BRICS states risk polarising the wider global Muslim community more generally. States are likely to label such behaviour and groups as ‘terrorist’, a term which makes dialogue more difficult. At the same time, such labels bring the US and its critics in the BRICS closer together. For example, Russia, which experienced its own ‘Islamic terrorism’ during its struggle against insurgents in the Caucasus, shares America's opposition to IS. Beijing too, may be as culpable as al-Baghdadi himself in overlooking domestic reasons for the Muslim population’s discontent, branding it as part of a wider issue of international terrorism. However, the likelihood that shared concerns by Washington on one side and Moscow and Beijing on the other, will lead to greater coordination in Iraq is unlikely. Instead what will probably happen is that alongside the rhetorical differences which exist between the US and the BRICS over state intervention and sovereignty respectively, there will be a tacit acceptance and therefore pragmatic consensus over creeping American military intervention – a development which is already reflected in the relative quiet of another US rival in the region, namely Iran. This tacit arrangement is likely to remain in play so long as the BRICS continue to have few direct interests in the country – and continue to be at limited risk from IS. Insofar as those risks remain limited to individuals – as in the case of Indian hostages – these will most likely be dealt with on a case-by-case basis. Indeed, it is possible that a change in the BRICS’ preferred non-interventionism is most likely where direct state interests are threatened; in the case of Iraq that is effectively limited to China. In sum then, the Iraq crisis does not appear to have substantially changed the way that international politics is managed by external powers. The rise of IS in Iraq constitutes a challenge both to the current system of nation-states regionally and to Muslim identity and organisation globally. In both cases the BRICS have shown a consensus with the US and the West, which is opposed to the rise of IS in Iraq and its global jihadist rhetoric. Militarily the US remains the hegemonic power in the region and has reinforced this through its recent air strikes against IS. The BRICS – and especially China – have either been willing to follow that course or have demurred. Such sentiments strongly suggest that the BRICS do not want to see any significant change to the current international status quo. However, this does not mean that the BRICS accept global American hegemony unquestioningly. The past decade has seen much criticism directed by the BRICS both jointly and individually at Washington and their wish to challenge the current global order is manifest. But as the case of Iraq currently shows, that desire is tempered; this antipathy towards IS indicates that the BRICS are not prepared to see global change transacted by such groups. If there is to be change, then it is to be done by themselves.